What an absolutely glorious day for graduation. 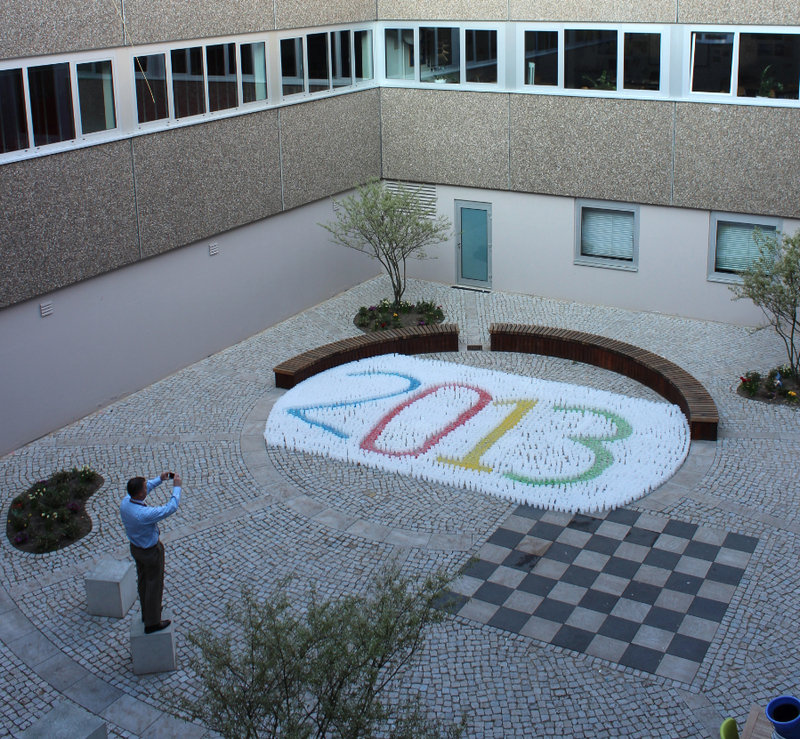 Good afternoon graduates, parents, faculty, and friends of our class of 2013. It is a great honor to welcome you, share a few thoughts, and introduce our distinguished graduation speaker. 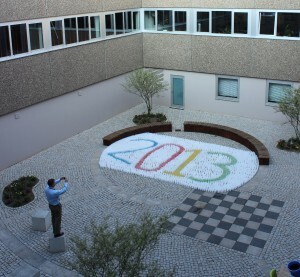 Class of 2013 leaves its mark on the FIS Alumni Courtyard. 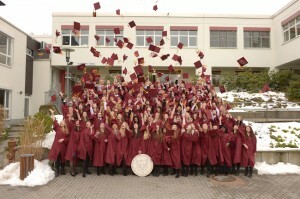 my knowledge, the second oldest and the largest international school in Germany. Yet, with only 119 students in the graduating class, I know each of you has felt yourself to be part of a close-knit family. Most important, though, you have completed a curriculum that emphasizes creativity, independent critical thinking, and the IB Learner Profiles that I am sure will stay with you. As a creative, independent thinking, and high performing group of students, you apply new unique contributions to all aspects of the school. Everyone knows what Saran Wrap is, or Clingfilm, as I believe it is called here in Germany. It is that clear sticky material that keeps food fresh and has several other creative uses. Some might argue that our senior class has a Saran Wrap obsession, also known as “Warped by Wrap”. Samuel Curtis Johnson, the founder of the Johnson Company that makes Saran Wrap didn’t find success quickly or easily. But, when he finally stirred up the concoction that was the basis for this “clearly” profitable wrap – in a bathtub – it was success that “stuck”. More than 120 years later, his perseverance and commitment remain the foundation for SC Johnson. Samuel Curtis Johnson set out to earn a living with the railroads. He took a job helping develop a new railway, so confident in its potential that he invested half his salary. The new railway business went bankrupt, taking his savings with it. Soon after, Samuel became a partner in a book and stationery store. Within a few years he had built up the capital to buy out his partner. But, despite Samuel’s reputation for honesty and integrity, this business, too, failed. One of the many “Warped by Wrap” creations. In 1882, nearly 50 years old, Samuel moved to Racine, Wisconsin with his family, and started over again. This time he became a parquet-flooring salesman for the Racine Hardware Company. It won’t surprise you to hear that after only four years, he bought out the business. But this time, Samuel’s investment had succeeded beyond measure. His company grew into the company that bears his name today. With just four employees, Samuel worked diligently as salesman, bookkeeper and business manager. Five days a week, he toured the countryside selling flooring and Saran Wrap to contractors for fine homes, churches, hotels and public buildings. But it was always about family in the larger sense, too. Throughout his life, Samuel donated 10% of his income to his community – particularly programs that supported young people. Among the many family memories of him, this commitment to community, along with his perseverance, is the most enduring. However, the origins and use of Saran Wrap has further symbolism for this class. In a sense, graduation is the event where the Saran Wrap comes off each student and you are free to take full responsibility for the choices and opportunities ahead of you. While a certain level of protection has been lifted, even greater opportunities await as you are exposed to the world to make it your own. In the same way the inventors of the Saran Wrap could not envision its huge success, I’m sure your parents could not have imagined the person you would become and the day when they begin to remove the Wrap and let you go. Would they say their daughter would become a fashion designer? Would they guess their son is going to be a surgeon? Would they have known he or she might speak four languages, be a songwriter, or be involved in humanitarian work in another country? Each member of the Class of 2013 has a story to tell, but we only have time for a few. Our stories begin with the Class of 2013 giving. Many of you have been to the Kalahari – some more than once. Others have joined in the Poland Drive or participated in the student Futures Committee with our Board of Trustees. Some have served as leaders of the Student Forum or Student Congress. One of you began the Junior’s Scholars Program at the Max Planck Institute where cutting edge research on protein cell is being done to help find a cure for Alzheimer’s Disease. This is a very dynamic class of artists – exploring many media forms and techniques. Those who attended the IB Art Exhibition this year saw a great deal of diversity in our student artists, which for the first time included an IB film about the sad fate of a beloved dog. This year’s art exhibition proved that this group of graduating artists was more than prepared to uphold the strong tradition of visual expression we have every year at FIS. The Visual Arts is only one of the areas in which our soon-to-be graduates excelled, and the stories continue through the performing arts. You have been a particularly creative class and this year we had a number of seniors in concert bands, a thriving choir and FIS Singers membership, and many actors and dancers who performed in Zeitgeist, Beyond Imagination, and Dance in Studio 186. All of this underlines your commitment and loyalty, since most of the rehearsals and performances have taken place in your free time – which, as we all know, is a rare commodity for FIS Seniors! 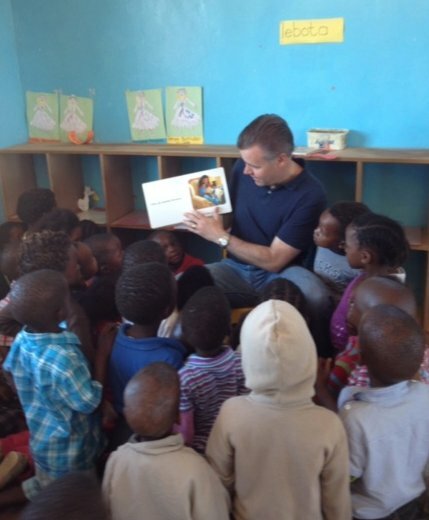 This penchant for performance started very early, as they were the first “First Graders” in the new Primary School. Your stories of athletics are filled with regular season and ISST success. Even with a heavy academic load, half of you competed in one sport or more this year. We have a graduate who was an all tournament player in three consecutive seasons in two sports. Some of you participated every season in the athletic program since Grade 6 through to Varsity, one of you helped to start the rugby program at FIS five years ago and we have several all tournament players. You lead, participate, and set the standard for sportsmanship. You will forever be known as the Class of 2013, but as I talk to the teachers and parents who know you best, you are proudly unique individuals as well. Our mission calls us not to “inspire a class” but to “inspire individuals” and ultimately the world is not changed by a class but by individuals who use their creativity, tenacity, and integrity to bring about a brighter future for all. As you move on, however, the multi-layers of Saran Wrap that have supported you: parents, teachers, security guards, friends and many others, will now release their caring protection and allow you to further blossom. Our graduation speaker this afternoon has yet another story to share. He is an individual who has no fear of building bridges in a changing world. The FIS mission begins with the statement that we inspire individuals to develop their intellect, creativity and character to become independent, adaptable, socially responsible and internationally minded citizens. FIS is very honored to have James B. Smith, the current U.S. Ambassador to the Kingdom of Saudi Arabia, speak to students and families at graduation. In his college days he was a history scholar before beginning his career with the US Air Force where he spent many years in the Middle East. Due to his academic knowledge and practical experience, he also served as a professor in the United States to bring about a greater understanding between the West and Middle East. Ambassador Smith is the highest-ranking American diplomat in Saudi Arabia looking at the relations, focusing on people-to-people interactions through commerce, education and cultural exchanges. With change and conflict sweeping the Middle East, the role of a diplomat has never been more challenging or important. In his commencement speech to the Senior Class of 2013, he will address the roles, responsibilities and accountability to society facing these young graduates as they make the transition from school to adulthood. Ambassador Smith traveled to Germany as a relative of a 2013 graduate and like the Saran Wrap, the importance of family surrounding each of you with support is a theme that has led to the very special day we have today. I welcome Ambassador Smith to address the class of 2013.